Wir sind Helden's downward slope continues with their third album: given the brilliancy of their debut, DIE REKLAMATION, their 2005 follow-up, VON HIER AN BLIND, disappointed, with only a handful of songs reaching the intelligence of their predecessor. SOUNDSO, their third album, followed in 2007, and most of it is simply redundant: it's pleasant, and it means well, but it's never compelling. "Endlich ein Grund zur Panik!" -- "Finally, there's reason to panic!" -- the first single's chorus exclaims, but, quite frankly, little on the album would even be reason to mild excitement. 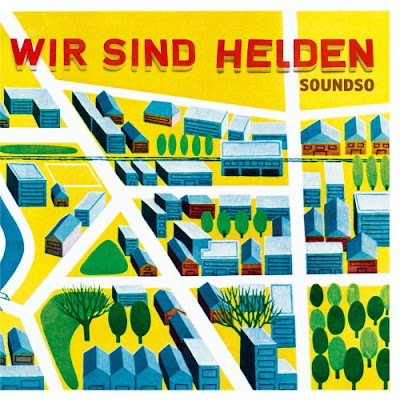 SOUNDSO features Helden's keyboard-driven funk rock on a few songs, while the majority of the record continues in the guitar-based pop vein of the second album, all of it written to highlight Judith Holofernes' sometimes tender, sometimes girlish voice. The problem is that most of the songs sound bland and generic, and the production doesn't help: most of the songs ("Soundso," "Labyrinth") don't have any space to breathe, most of them are too polished to generate any friction, and while melodies exist, they're not particularly gripping. And where Wir sind Helden's songwriting used to combine clever wordplay with intelligent observations, SOUNDSO's songs are simply banal. Holofernes strives to write clearer, less ambiguous lyrics than before, but it robs the songs of everything that made them interesting in the first place. Which is even more disappointing considering the fact that all members of Wir sind Helden are intelligent people whose interviews are much more thought-provoking than their music is: the four of them manage to speak about work and what it means to people with enough insight that it would put most politicians to shame, but when they write a song about it, they can't even fill three minutes with their reflections ("[Ode] An die Arbeit" -- [Ode] To Work). "Endlich ein Grund zur Panik" is about public fear, but it doesn't manage to say anything about its theme, while "Der Krieg kommt schneller zurück als du denkst" (The War Comes Back Faster Than You Think) doesn't even express anything that goes deeper than its title. Yes, the band wants to be received on a less political and more personal, serious level -- but SOUNDSO is simply lazy, especially when you know they managed to be both funny and serious, both political and personal the first time around. The album is listenable and nothing on it is exactly bad -- but if a newcomer band had delivered it, it would simply be ignored. This review was written for the All-Music Guide on September 19, 2007.